When it comes to choosing flooring for a house from your timber supplier in North Wales, one of the biggest considerations you will need to make is the type of wood. There are many different types of wood that can be used for a home and the ideal wood for you depends on your lifestyle and the aesthetic of your home. 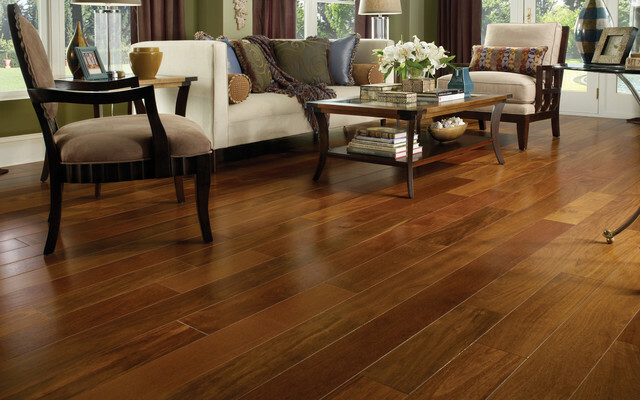 Wood flooring is very popular because it is durable, long lasting, looks beautiful and is easy to maintain. It comes in a lot of different sizes and styles, but essentially there are two basic types of wood – engineered wood and solid wood. Tradition solid wood flooring is milled from a piece of solid wood and engineered wood flooring is a laminated plank that is manufactured from many different pieces of wood. Typically in engineered wood the top layer of the wood will be very high quality while the lower layers of wood are not as high. Engineered wood is advantageous because it is more reasonably priced and it can also withstand humidity and temperature fluctuations well. However, unlike solid wood it cannot be re-stained and re-sanded over and over again. Both of these types of flooring are available in a wide range for wood species and tones. When it comes to solid hardwood floors, you can choose from hard and durable species such as cherry, pine, oak and maple. There are also exotic woods such as Brazilian cherry and mahogany, which are not as durable but are highly prized for their beautiful appearance. When you are choosing, make sure that you consider the size of the floorboards, the ease of installation, the type of subfloor and the room itself. Another thing to keep in mind is the colour of the wood and how it fits with the look of the room in which you will be installing it. However, don’t feel like you are limited by the range of browns available naturally in the wood. There are many stains available so you can make your floor any colour and tone you like. One thing to consider is the amount of traffic that the floor is going to get. If it is in an area of the house that a lot of people will be walking through, it is important to choose a hard wood such as hickory or oak. A wood such as black walnut or black cherry will be soft and will not be strong enough to stand up to a lot of traffic. They are better for low traffic areas where people won’t be walking across them multiple times every day. Another consideration to make is the humidity level of the room. Some woods are better than other for bathrooms, as these rooms tend to have a lot of humidity which can warp the wood overtime. Also, it is important to remember that the wood will need time to acclimate to the humidity and temperature of the room before you install it. If you install the wood before it has a chance to settle, the flooring will crack or buckle. It is highly recommended that you leave wood out in a room for seven to 10 days before you install it. Also, it is important to arrange the wood so that it is exposed to the air on all four sides. Here are a few more important things to consider when you are choosing a wood floor for your home. What are the widths of the boards? Thinner strips give the impression of more space, while thicker wooden plans give a more rustic look. Don’t forget to consider what type of subfloor you have. The most common types of subfloor are plywood, particleboard and concrete slab. This can help you to determine whether or not you should install solid wood floors or whether engineered wood would be better. If your floor will get a lot of traffic, avoid using a polyurethane finish. It has a high sheen but when the floor gets scratched the light reflecting off the finish will make the flaws look worse. When choosing your flooring, take the time to visit the timber supplier or builders merchant in North Wales in person and see the wood for yourself so that you know what it looks and feels like before you buy.